NEW DELHI -- Two managers of a New Delhi budget hotel where a fire killed 17 people have been arrested, police said Wednesday. 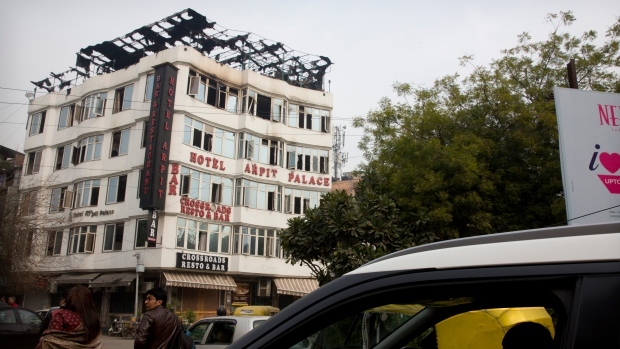 The general manager of the Arpit Palace Hotel, Rajender Singh, and manager, Vikar Kumar, were booked on suspicion of culpable homicide for the fire Tuesday, Delhi police spokesman Anil Kumar said. Police Additional Commissioner Amit Sharma said the fire, which also injured four people, was likely caused by a short circuit. Most of the deaths at the hotel in Karol Bagh, an area in central New Delhi full of shops and budget hotels that make it popular with tourists, resulted from suffocation, according to the Delhi government minister of health and urban development, Satyendar Kumar Jain. A friend of a family of 13 who had travelled to Delhi from southern India to attend a wedding said three members of the family had died from burns. The hotel developer had a permit from the fire department to build up to four stories. But the building appeared to have six floors, including an unauthorized kitchen Jain said was built from sheets of fiberglass on top of the roof. A video shot by a witness showed the roof consumed by flames. Fire authorities said wood-paneled hallways and stairwells fed the fire and cut off escape routes. 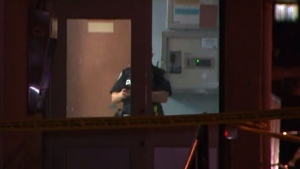 A video provided to The Associated Press by fire officials showed a firefighter carrying a person over his shoulder through an unlit, charred stairwell. Firefighters rescued about three dozen people by breaking windows to access those trapped inside. The injured, including a woman from Myanmar who authorities say sustained spinal injuries after jumping from an upper floor to escape the flames, were taken to hospitals for treatment. Their conditions were not immediately known. Relatives of Lal Chand, a longtime kitchen supervisor at the hotel, were waiting outside a mortuary after looking for him at three hospitals. “We have checked so many bodies, but could not find him. Till now we cannot trace him,” said Chand's brother, Satish Kumar. Associated Press videojournalists Rishi Lekhi and Shonal Ganguly contributed to this report.